Libraries are on my mind this week, ever since my sister-in-law posted on Facebook a photo The Deserter's Daughter that she had requested from her public library and which she had just been to collect. This was a couple of weeks before publication day, so it came as something of a surprise to me, as you can imagine! Coming from a family of lifelong library-users, and speaking as a former librarian, I am delighted and proud to know that my book - my book! - is going to available on public library shelves; and I am enormously grateful to all those dear folks on Facebook who have told me they have put in library requests, not just in the UK but in other parts of the English-speaking world. Oh, and that wonderful moment when I was in Llyfrgell Llandudno Library and I found The Deserter's Daughter in the catalogue! Bliss! Was it big-headed to take a screenshot? I don't care: I'm so proud. And I know that my late mum and dad, who both joined the library as children and borrowed books all their lives, would have been chuffed to bits. Thanks, Jen. I'm glad to know I'm not alone in taking screenshots! I do hope your local library stocks The Deserter's Daughter. The hardback is published over there on September 2nd. Thank you, Kirsten - the more library requests the better! That is the main market for hardbacks, as you know. I'm so lucky that The Deserter's Daughter is generating plenty of requests. Keep spreading the word! Hi, Carol. Thank you for your kind message. You know how much I appreciate your support. 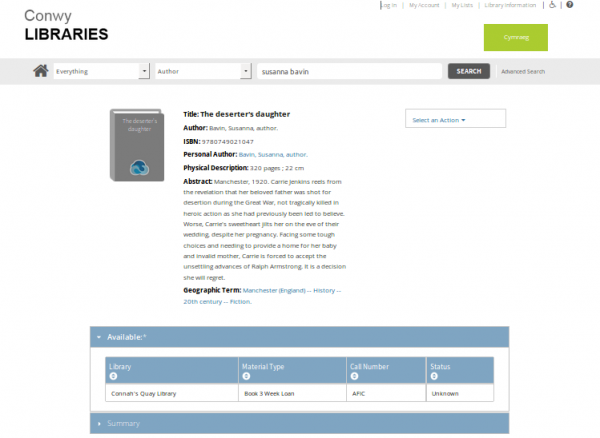 Yes, it was indeed a grand moment when I found The Deserter's Daughter in Conwy's library catalogue. I am looking forward to its being added to stock. I know there have already been some requests, but after they have been satisfied, I'm sure the beautiful cover will ensure the book is regularly picked up for a closer look by other readers. Kate, thank you for your comment. You're right - I couldn't resist taking the screenshot. As for th shelfie - do you have a photo of The Magic of Ramblings on a library shelf or a bookshop shelf? Please don't feel that your public library is letting you down. The Deserter's Daughter isn't officially out until June 22nd. I don't know why Hertfordshire Libraries got ahead of themselves and supplied it so early, but my sister-in-law doesn't mind! What a grand moment, Susanna! And for all the libraries too, who will be proud to add The Deserter's Daughter to their shelves. Just think of the many people who will be surprised and delighted with their new find and those who have ordered in advance will be waiting in suspense to open that glossy new book! Good times ahead! Wendy, how sweet of you. Thanks for your kind words. I'm sure that one day you'll have the same experience. It is certainly worth waiting for. Not big-headed at all, Susanna. I would do just the same thing... and be just as proud!